-- Video Rendering Normal, Overlay and VMR9 modes. -- Multilanguage Interface Support for more than 25 languages : english, german, dutch, french, romanian etc. -- The easiest way to control ChrisTV by a simple mouse click. 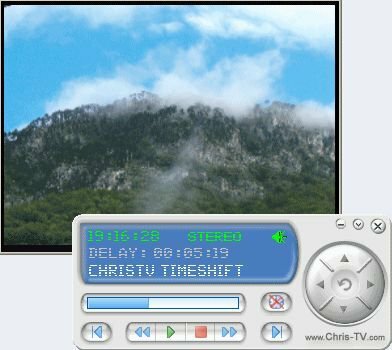 -- ChrisTV TimeShift TimeShift lets you freeze the live TV stream, giving you a break while is still recording. -- Background/Silent Mode Recording ChrisTV PVR will record your favorite TV show in background with no video/sound preview, minimized in systray. -- System TrayIcon Have instant access to your channels list and main settings by a simple mouse click on ChrisTV trayicon. Also you can minimize ChrisTV to the systemtray net to your clock. -- LivePreview Mode Bypasses the MPEG Hardware Encoder of your card(s) and there won't be any time delays - realtime preview (realtime play for console games). Available only for MPEG hardware encoding cards that have support for LivePreview. -- AVI Recording Module Available for software encoding cards and MPEG hardware encoding cards with LivePreview support. -- Software MPEG Recording Module Registered MPEG 1/2 Filter required to be installed Available for software encoding cards and MPEG hardware encoding cards with LivePreview support. -- Hardware MPEG Recording Module Create MPEG 1/2 files using your TV Card with MPEG Hardware Encoder. -- Adjust Recording Length Set the recording duration after you have started a manual recording task. -- Prefilter Settings for Hauppauge PVRs, ATI Theater 550/650, Conneant Falcon, Conneant Blackbird TV cards Improve image quality and sharpness. -- Scheduler Module ChrisTV PVR will record your favorite movies unattended. You can leave your PC in Standby/Hibernate Mode and ChrisTV PVR will wake your PC and record your shows. -- Sleep Timer Feature Let ChrisTV close your PC at a specified time. -- Active/Favorite Channel List You can choose which are your favorite channels. -- ChrisTV Channel List Importing So you won't need to scan and set the channels settings again. -- Multimonitor Support You can easily use ChrisTV on Multimonitor Desktops. -- Optimized Channel Switch Time Faster channel change. -- ChrisTV Configuration Wizard Configure ChrisTV Settings in 5 easy steps. -- Multituner Support This feature will allow you to watch your favorite TV channel using 1 capture device and record another channel(s) with the other capture device(s) that you have installed on your PC. -- Customize MPEG Recording Settings Set your custom values for stream type, frame size, video/audio bitrates. -- Customize Hardware MPEG Recording Settings Set your custom values for stream type, frame size, video/audio bitrates. -- Video Frame Cropping Feature for Recording Available for AVI and software MPEG recordings. ChrisTV PVR Professional 6.20 Fast Download via Rapidshare Hotfile Fileserve Filesonic Megaupload, ChrisTV PVR Professional 6.20 Torrents and Emule Download or anything related.